Book multiple party bikes! Custom tours are great for large groups, teams, and corporate events (16+ people). 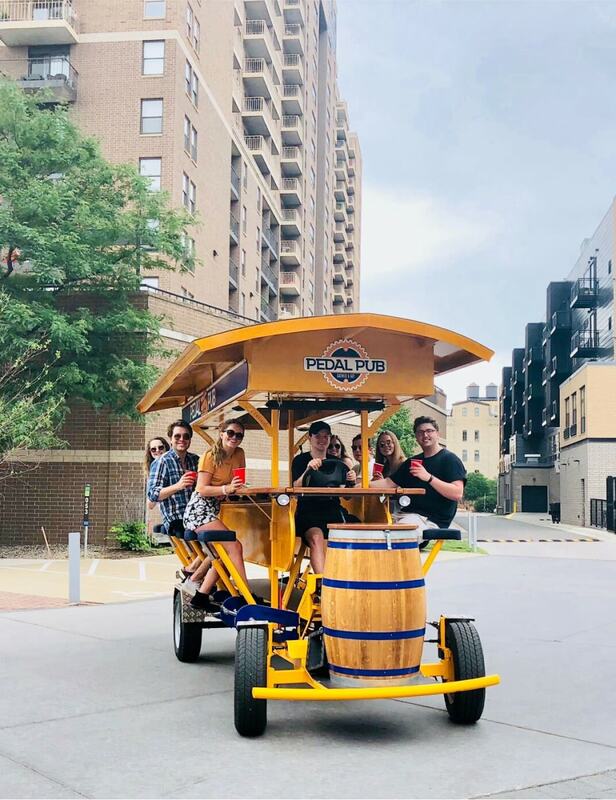 You can choose your own route & stops, or your Pilot – a certified guru in the local bar scene – can put together the best pub crawl possible for you and your friends. We have a total of 4 bikes here in Calgary, which means that we can accommodate groups of up to 64 people! To book a custom tour, please contact us directly at 1-403-540-8854, or submit an inquiry form below. Want to Schedule a Custom Tour? All riders must provide photo ID at the time of tour, and each must read and sign the Pedal Pub® Release of Liability Waiver. 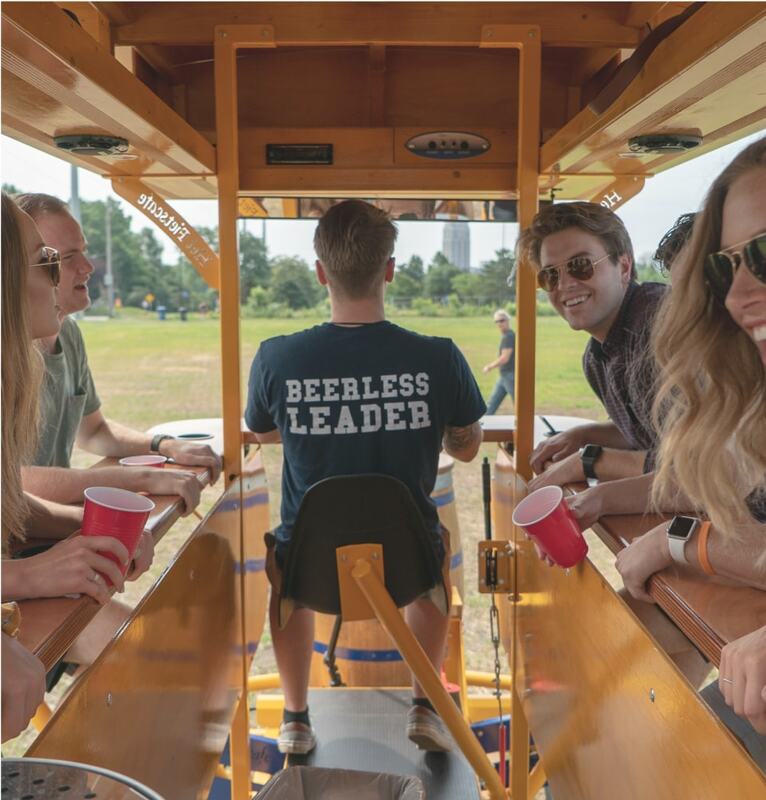 10 Pedal Pub "Pro Tips"
Don’t show up drunk! We cannot allow anyone on board who shows up drunk. Complete the e-waiver prior to your tour date. Please arrive thirty minutes prior to your scheduled departure time. Feel free to bring your own water and/or snacks. news on this topic in the future! Bring a fully-charged phone (for pictures, music, Uber rides). Have a “pick-up plan” for when your tour ends (no loitering). Sampling all the beers our brewery friends have to offer is fun, but not great use of our tour time. Arrive with a plan, or defer to the taproom experts! Drink responsibly and be respectful. Always listen to your Pilot! 1. How many people can ride? Each bike holds up to 15 people! All riders must be legal drinking age and must present valid identification. Please dress appropriately for the predicted weather conditions. We ride rain or shine, so dress accordingly. Closed-toe shoes or sandals – we don’t recommend heels! 4. What if I can’t pedal? No problem! There are 10 pedaling spots and 5 non-pedaling spots on each bike (3 non-pedaling seats on the back bench, 2 non-pedaling seats over the axels). 5. Where does it start? Check your route as each departure destination is specific to each tour. 6. When should I arrive? 7. Do I tip my driver? Tips are always appreciated. If you had a great time, a standard service industry tip is customary. 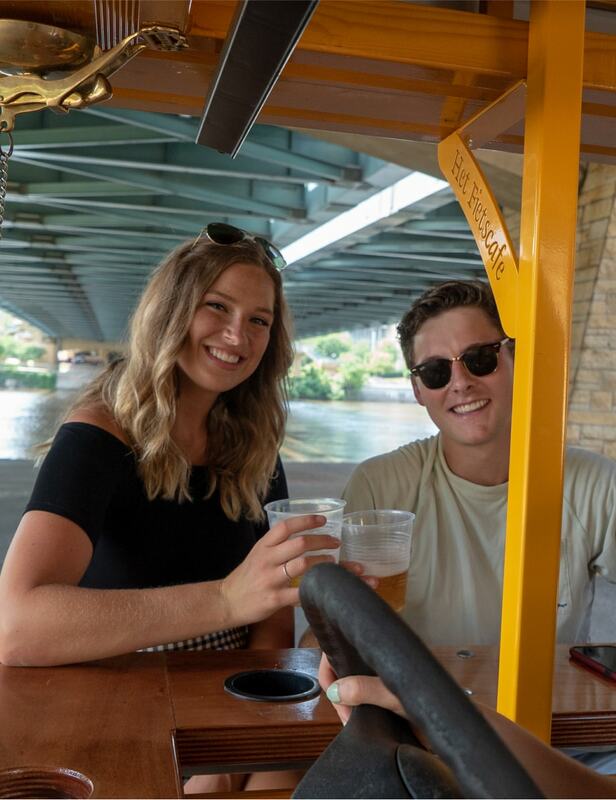 Automatic gratuity of 15% will be added to any tours involving multiple Pedal Pub bikes. distance from each departure site. 9. Can I rent multiple bikes? Yes, it is easy to rent multiple bikes! We have a total of 3 bikes here in Calgary, which means we can accommodate groups of up to 45 people! Please contact us directly for more information or call 403-540-8854. 10. What’s included in the price? Each two-hour tour includes a rad guide to get you laughing, dancing, fist-pumping, and belting out your favorite jams! You’ll also get promotional pricing on drinks and merchandise from our partner establishments, and of course transportation aboard your very own parade as we take you to some amazing spots! Submit a brief message and someone from our team will help you plan an amazing tour experience!